The robotic arm is a 5 degree-of-freedom manipulator that is positioning the instruments and systems on the turret at its end. 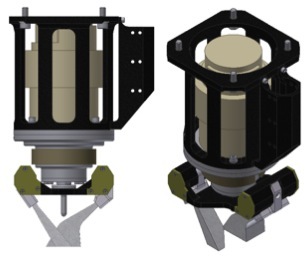 A set of rotary actuators installed in the shoulder azimuth joint, the shoulder elevation joint, the elbow joint, the wrist joint and the turret joint enable the arm to move. In between joints, structural elements are installed. 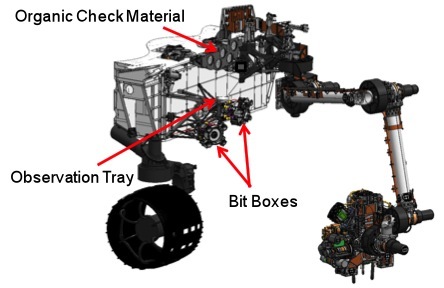 When fully extended in the forward direction, the center of the turret is 1.9m from the front of the rover vehicle. At its end, 5 devices are mounted on a turret which is 60cm in diameter including the instruments. Two of these devices are the contact science instruments (MAHLI and APXS). The other three are concerned with sample acquisition and preparation. 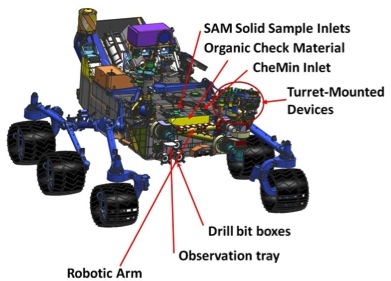 The Powder Acquisition Drill System (PADS), the Dust Removal Tool (DRT) and the Collection and Handling for interior Martian Rock Analysis (CHIMRA) are installed on the turret. The robotic arm can place the devices and instruments in their respective sampling position within the robotic arm workspace which is a cylinder with a 80cm diameter, a height of up to 100cm and it is positioned 105cm in front of the rover. It extends to 20cm below the surface when the vehicle is parked on flat terrain. The RA is capable of exerting large forces between the turret devices and the targeted rock or soil area. These are required to stabilize the drill during its operations. This condition is achieved by placing the drill against the surface and then overdriving the actuators resulting in the entire system winding up against the stiffness of the arm itself. A force of 240-300N at the tip of the arm will be achieved. When in motion, the arm will be operating at a speed of about 1m/s. MSL’s drill, or Powder Acquisition Drill System (PADS) as the instrument is called, is a hammering drill capable of acquiring samples from up to 5 centimeters below the rock surface. The drill generates a fine powder that can be analyzed by the rover’s instruments including the laboratory instruments SAM and CheMin. 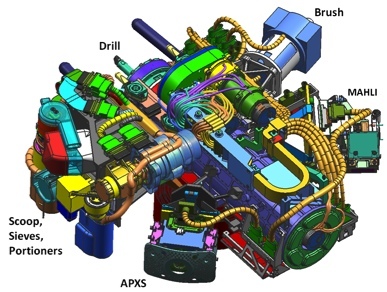 The system design is a powerdering drill that can not collect intact cores. When the drill bit is in its position against the rock at the proper force, PADS can retrieve samples without making it necessary to move the arm. 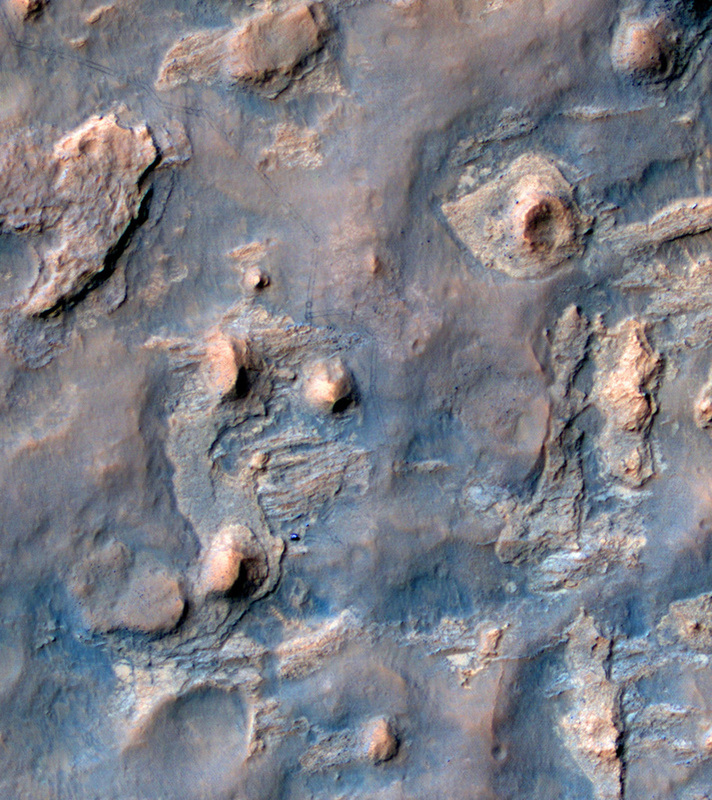 PADS can physically translate down the drill and into the rock’s surface. It also rotates the bit at 0 to 150rpm to cut out material and it exchanges drill bits from the drill. The actual drill penetrates the rock and provides the powder that will be analyzed. The powder travels up through an auger in the drill and is directed into two chambers with a transfer tube interfacing with the CHIMRA processing device. Gravity prompts the movement of the powder through CHIMRA by changing the orientation of the robotic arm. Vibration techniques are also available. The holes that are drilled into rocks are 1.6cm in diameter and up to 5cm deep. Material from the first 2cm of the hole is deposited around the hole and is not allowed to enter CHIMRA. Below that depth, sample material enters the processing system and eventually the analytical instruments. Grain size and temperature of the powder as it is extracted depends on the nature of the rock that is drilled into. Should the rover arm slip during drilling operations, the drill could get stuck in the rock as a consequence. To recover from this situation, the drill can disengage from the bit and free itself at the cost of one drill bit. During the mission, bits will be exchanged when the old ones are worn down after use on particularly hard material. Two spare bits are available inside drill boxes that are installed on the front of the vehicle. After discarding an old bit, the RA drives into a hover position, checks alignment and autonomously engages and captures the spare component. It is not expected that the drill will show significant wear&tare should operations be conducted in a pre-planned manner. CHIMRA’s clam-shell scoop mechanism takes control over the sample at depths of up to 3.5cm. Also, the scoop can retrieve samples from wheel-dug trenches reaching material in depths of 20cm below the original surface. The volume of a sample after scooping is complete will vary from 1,000 and 30,000mm³. The CHIMRA device sieves and portions the samples coming from the scoop and the drill and then distributes them to the analytical instruments. Numerous chambers and labyrinths within CHIMRA are utilized to sieve and sort the material. 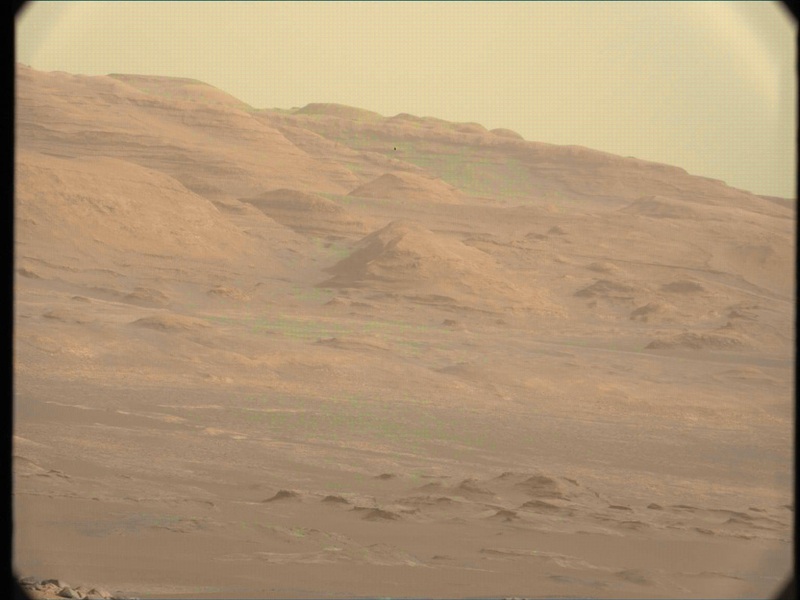 The sorting function is accomplished by rotating the robotic arm turret actuator with respect to the gravity vector of Mars. To prompt movement, vibration is also available that is initiated by a vibration actuator inside the CHIMRA subsystem. Samples that have been processed by CHIMRA will have grain sizes of no more than 150 microns. Also, CHIMRA is dividing the sample into several portions of 45 to 65 mm³ for the SAM and CheMin instruments. Sieved material for 6 portions will be generated should re-testing in the instruments become necessary. Grain Sizes of up to 1mm and portions of up to 130mm³ are also available via CHIMRA. Those will be analyzed inside SAM. Contamination of the interior of CHIMRA especially the fine sieves is prevented by delivering one or several shocks to the sieves enabling left-over materials to fall out of the sieve. SA/SpaH also includes covers that protect the solid sample inlets of CheMin and SAM. Contamination from the atmosphere and dust deposition are prevented that way. The covers are opened and closed by a single motor per cover. For sample delivery, the cover is being opened and the CHIMRA sample chamber outlet is then positioned over the top of the exposed solid sample inlet. After the sample has entered the respective instrument, the covers are closed once again. DRT is a tool mounted on the turret at the end of the robotic arm. The tool is used to remove dust and loose material from rock surfaces that are targeted to be examined. Stainless steel wire brushes are driven by a single actuator. The Robotic Arm is responsible for properly positioning the Tool at the correct standoff distance to the surface that is supposed to be cleaned. An area with a minimum circular diameter of 4.5cm will be cleaned by the brushes without motion of the robotic arm. DRT is also used to clean the observation tray when samples that are placed on it are no longer required. The Observation Tray is allowing processed samples that have been delivered by CHIMRA to be examined by APXS and MAHLI. It is comprised of a flat titanium tray with a diameter of 7.5cm. Material that is not required for SAM or CheMin analyses can be transferred to the tray for observation by the contact instruments in order to increase science results for one particular sample. After analyses are complete, the tray will be cleaned with DRT. The Organic Check Material is a measure to check that SAM Investigations do not include terrestrial contamination above the detection levels. 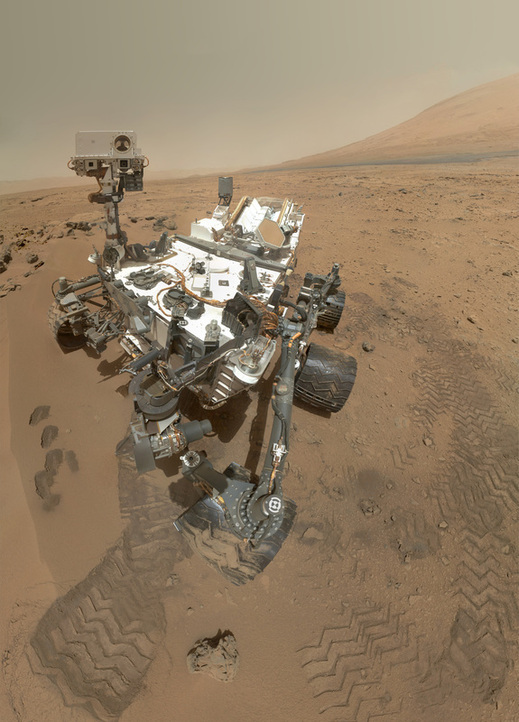 Efforts have been made to keep the Rover away from any contamination sources, but experience has shown that a slight amount of contamination is always present on any given spacecraft. SAM analysis of the sample will reveal any contamination from Earth as the material passes through SA/SPaH. OCM will also be used to check how large the effect of contamination between Martian samples is inside CheMin’s sample cells as the OCM is not causing XRD and XRF patterns. 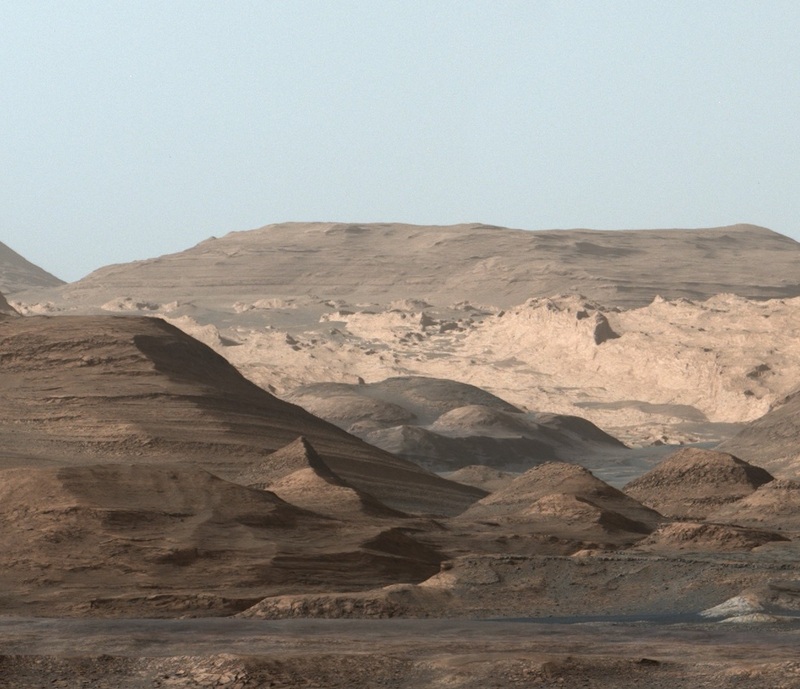 Should peaks show up in the spectrum, scientists could deduce the level of contamination and re-evaluate the accuracy of the system on Mars.